Valentine's Day is such a fun time to get your high school students talking about love and relationships. Yes, here are some engaging activities that even the boys will love. 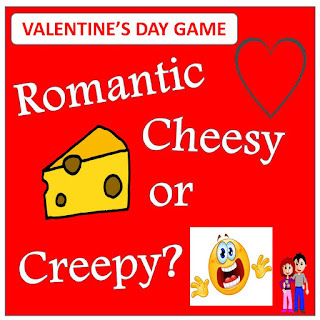 So funny, this Valentine's Day game asks students to look at the situation on the Powerpoint slide and vote whether it is ROMANTIC, CHEESY OR CREEPY! How would you feel if someone wrote you a poem? Do you think it's romantic? Or even, what do you think of couples who wear matching clothes? What about Promposals? Or making out at the lockers? 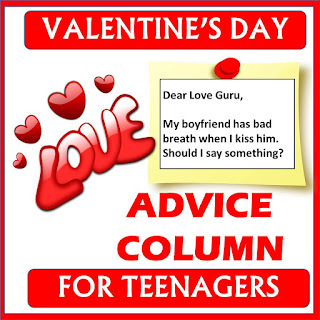 Another favourite resource that I use with my students on Valentine's Day is The Love Advice Column, also known as The Love Guru. Here, students respond to different letters sent to the Love Guru. Examples are: My parents don't like my boyfriend. What should I do? Or another is: How do I break up with my girlfriend without being the bad one? Or how about: My boyfriend is much older than me, is that O.K.? Be sure to check out our Teachers Pay Teachers store for these lovable resources!